So it was pretty natural I’d become obsessed with this show (such a sucker for a good opening credits sequence, too) and also its weird air schedule where it seems as if episodes are both always airing and never airing. Anyway, the main girls are all being stalked and tormented by “A” throughout the series and I understand that a lot of danger is involved in that but…it’s also kind of cool. I want to be Spencer and figure stuff out and become borderline Jessie Spano and I want to be Aria and pair crazy patterns and I want to be Emily and take control of my life I want to be Hanna and just…not quite get it. Crazy patterns aside, these girls dress WELL. Okay, well they dress over-the-top. Remember watching Clueless for the first time and thinking, “WOW, will I dress like that in high school?” and then getting to high school and realizing “no, I won’t dress like that” but you kind of blame it on not being in L.A.? 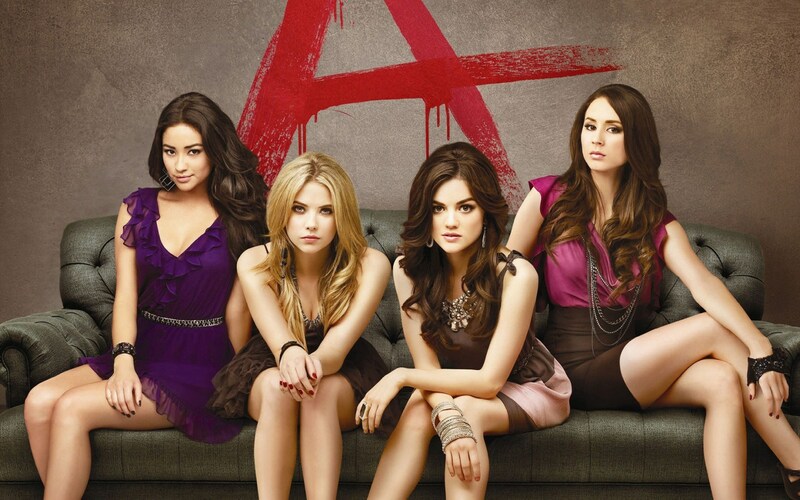 Well, on Pretty Little Liars it doesn’t matter where you are, you are dressed as if you’re going to a club. Even Emily’s more-casual overall look is nicer than anything I own. Also, Aria and I totally own the same dress…I just didn’t wear enough chunky jewelry with mine. And as if their normal school attire weren’t enough, they ALSO wear costumes ALL THE TIME. My dream is some kind of perpetual costume party land where I always need to put a new costume together. So maybe my dream land is Rosewood. Ashley Benson is awesome and I think Hanna gets pushed aside a lot because she can be ditzy but she’s actually had a pretty rough go of it! Hanna has some of the best (read: funniest) lines in the series and I love how her personality totally balances out the group. Hanna is my dream friend. Or, maybe I’m the Hanna. Oh gosh. Probably. Firstly, Hanna’s mom is played by Laura Leighton who is in an amazing episode of Law & Order: SVU playing Sarah Drew’s (from Grey’s Anatomy) mom and sleeping with Hunter Parrish! So I was basically sold on the casting of everything from the start. Anyway, I love any and all guest stars on anything. I am a SUCKER for them, even. But on Pretty Little Liars the guest stars sometimes feels AIMED at me. I mean, Larisa Oleynik as Fitz’s baby mama? And then star of Center Stage, Amanda Schull as Aria’s dad’s mistress? Perfection.